Lidar image of El Zotz, the closest city to Tikal. Using an airborne laser mapping technique called lidar, an international team of archaeologists has uncovered an astounding number of previously undetected structures belonging to the ancient Maya civilization—a discovery that’s changing what we know of this remarkable society. As difficult as it is to believe, this mapping effort, which is now the single largest lidar survey in the history of Mesoamerican archaeology, revealed the presence of 61,480 distinct ancient structures hidden within the dense tropical rainforests of Guatemala. Using lidar, archaeologists were able to document a new site north of Tikal. The elongated building at top right is part of a complex that may predate 500 BC. Across the valley is a large acropolis, which is likely a thousand years younger. This project, the details of which were published today in Science, involved a team of 18 experts from the U.S., Europe, and Guatemala, and as Garrison points out, it’s providing new insights into ancient lowland Maya civilization, particularly in regards to its demography, agriculture, and political economy. Lowland Maya civilization flourished for nearly 2,500 years, starting around 1,000 BC and ending with the arrival of Europeans in the 16th century AD. The ancient Maya, whose range extended from what is today southern Mexico, Guatemala, and Belize, were known for their sophisticated architecture, art, writing, astronomy, and math. At its peak, this civilization had spread across a territory measuring 36,000 square miles (95,000 square kilometers) in size, much of it wetlands. Today, a sizable portion of this territory is obscured by rainforest, which is difficult to explore on foot. As a result, there are some gaps in our understanding of ancient Maya societies. And that’s where lidar can help. This aerial survey technique works by shining pulsed laser light onto a target area and measuring the reflected light with a sensor. Lidar produces a high-resolution, three-dimensional view of the area below, revealing, as in this case, previously unseen surface features. 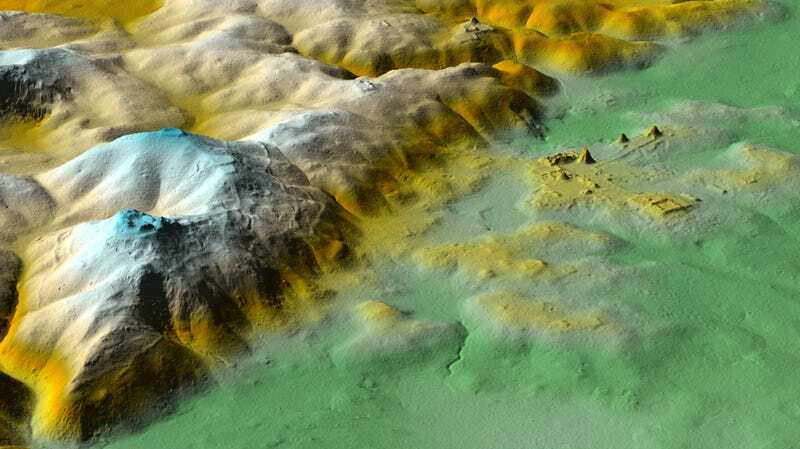 The lidar survey was done in 2016, and it covered 828 square miles (2,144 square kilometers) of northern Guatemala. The researchers, led by Marcello A. Canuto from Tulane University, mapped a dozen different areas in Petén, Guatemala, acquiring Lidar scans of Maya settlements and infrastructure. As noted, the survey resulted in the identification of 61,480 ancient structures, which were further analyzed using pre-existing maps previous excavation work. Importantly, however, many of these sites were also confirmed by ground-truthing (i.e. visually inspecting the sites from the ground) and by conducting new excavations, both of which were done from August to December 2017. This study required months of meticulous work, in which researchers had to translate lidar terrain data into meaningful archaeological interpretations. All three images above are of the site of Dos Torres, in the rugged karst hills between the cities of Tikal and Uaxactun. Looking at the lidar data, the researchers estimate that between 7 million and 11 million people lived throughout the Maya Lowlands during the Late Classical Period (650 to 800 AD). This ancient population was unevenly distributed across the central lowlands, with varying degrees of urbanization. Approximately half of the central Lowlands are seasonal wetlands known as bajos. Because permanent settlements tended to avoid these flood-prone and poorly drained areas, they remained largely uninhabited and could then be available, after added investment, to intensive agriculture. And indeed, of the area scanned, around 507 square miles (1,314 square kilometers) of land was used for agriculture, of which 140 square miles (362 square kilometers) had to be heavily modified. The scans also revealed an extensive network of roads (the researchers documented around 66 miles [106 kilometers] of causeways), which connected cities and towns. Many of these urban centers were heavily fortified, which wasn’t expected. Indeed, the Maya did engage in warfare from time to time. Garrison says their own written accounts provide vivid descriptions of war, in one case using hurricanes as a metaphor for the fury of war and, in another describing its aftermath as the “piling of skulls and the pooling of blood.” Archaeologists also had knowledge of some defensive earthworks at sites like Tikal, and even at strategic landscape points in the western Maya area. But the new lidar data is showing that these features were far more common than archaeologists had imagined, reflecting a previously unconsidered level of militarization. Garrison admits that lidar isn’t perfect, and that it misses some things and occasionally makes natural features appear artificial. Overall, however, he feels “this is an almost complete footprint of the ancient Maya.” Which brings up another limitation.